Foster real-time communication among colleagues & staff. Discuss admissions, transfers, & diagnoses in real-time. Encourage conversations between physicians and patients. Use secure messages & alerts to help patients understand their care plan. A secure and private alternative to SMS. Send & receive messages without having to share your personal phone number or email. Spend less time on the phone. 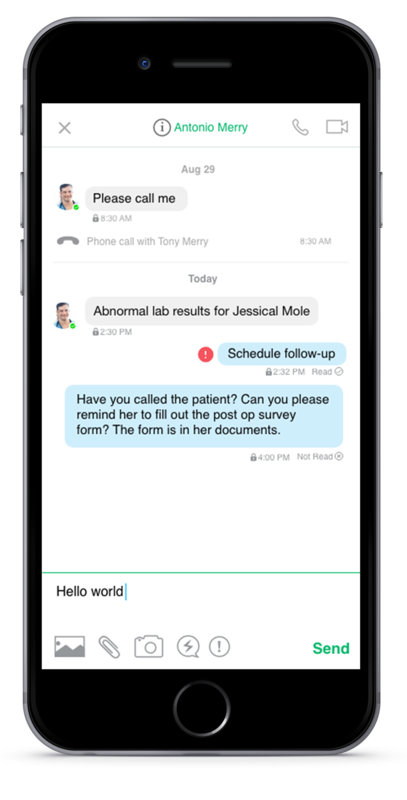 Use secure messaging to coordinate appointments & referrals. Share messages with up to 256 people at once. Create patient care groups to improve care coordination. End-to-end encryption so that your messages, images, documents and calls are secured from falling into the wrong hands. Use video or voice calls when text isn’t enough. Make calls using your phone’s internet connection. Ensure privacy with an identity verification badge. The green verified badge lets people know that the account is authentic.